People around the world celebrate Easter in quite different ways and there are various traditions around the globe. Some other elements are fairly common though, for example painting Easter eggs, hiding them, and children hunting for them on Easter Sunday. 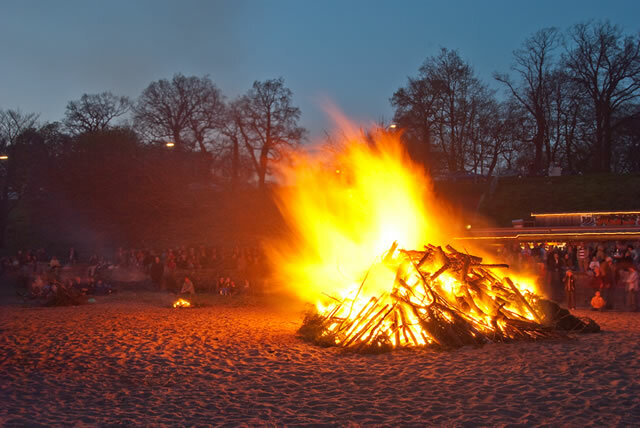 One of the memories from when I was a kid are the huge Easter fires people light on the North Sea beaches. I did some online research and the practice of lighting Easter fires appear to be rather unique to Germany, as well as the Netherlands and some Northern European countries. There are different explanations to the tradition. As a Christian rite, the fire represents Christ as the light of the world. Sometimes a Judas figure is burnt as well. As a pre-Christian fertility ritual, the fires were supposed to chase away the winter and its evil spirits.